One interesting aspect of John Brown’s attack on Harpers Ferry in October 1859 was the lack of a uniform response in the South. Even though Brown hoped to destroy slavery with his raid in western Virginia, southerners had a variety of responses. Many southern newspapers published articles in late October 1859 that held Republicans responsible for the violent event. These editors also portrayed the Republican party doctrine as responsible for pushing radicals like Brown and his men to attack the South. The attack and allegations of Republican support only reinforced southerners’ perspective that members of that sectional party were dangerous abolitionists who were committed to the destruction of slavery. Yet while some southern editors predicted an increase in sectional tensions, others saw hope for the United States’ future. On November 3, 1859, the Fayetteville Observer published an excerpt from a Republican editor who expressed outrage over Brown’s actions and argued that his party “[would] return to a more national and conservative policy.” Other southern papers glossed over the factions that existed within the Republican party, but the Observer’s editor was one to highlight that not all Republicans supported violent actions. ” With “conservative Republicans cutting loose from the ultra fragments of their party,” the Observer believed “to bring the best of all good out of the late evil at Harper’s Ferry.” Radical Republicans were only “fragments” and their views did not represent those of all members in the party. While this optimistic perspective did not last, it reveals that even two weeks after the Harpers Ferry raid, not all southerners were convinced that an increase in sectional tensions were inevitable. At the recent unveiling of the House Divided project, held June 13th at Dickinson College, Pullitzer prize-winning author and Civil War historian Mark Neely spoke on party politics during the 1850s. He also allowed us a brief interview, during which time we were able to get his impression on Sherman’s March to the Sea and its implication as an example of ‘total war.’ While Professor Neely does not agree that the March was ‘total war’ in a modern sense, Sherman used some of the fiercest tactics yet seen during the war. Indeed, Sherman hoped to have the South “…begging for mercy…” at the conclusion of his march. 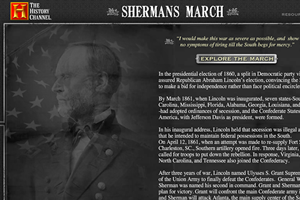 This History Channel website provides an interactive map, complete with audio and images, detailing the three campaigns of Sherman’s march. Principal battles of the campaigns and other events are explained, and factoid boxes provide information on little known tactics, events or other interesting things about the March to the Sea. An interesting, thoroughly 21st century tech exploration of this crucial military movement. 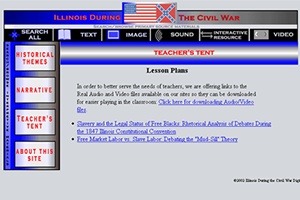 Illinois During the Civil War database has a Teacher’s Tent that has a few lesson plans specifically on the legality of slavery. These lesson plans include standards, but I believe they’re only Illinois state standards. 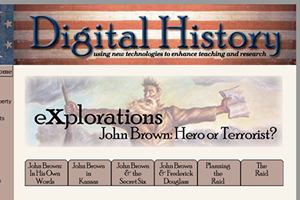 The Underground Railroad Digital Classroom also provides lesson plans for several levels and also includes standards. I was reading Mark Neely’s The Boundaries of American Political Culture in the Civil War Era and thought the first chapter had a very interesting story that can be used to provoke discussion among students about politics of the 1864 presidential election in comparison to the politics of the 2008 presidential election. Neely tells the story of Walt Whitman and his return from Washington D.C. to Brooklyn in order to vote. While at a bar, he noticed the barmaid wearing a McClellan pin. He asked the girl about the pin and she said that all the barmaids who worked at this bar supported McClellan and those that didn’t were not tolerated. Whitman describes how this was “one of those places where the air is full of scent of low thievery, foul play, & prostitution gangrened”*–not a place one would expect much political involvement. Neely uses this anecdote to introduce his point about the high level of involvement of the general public in politics during the Civil War Era. Some points to take away in order to lead a discussion among students include the fact that barmaids would be so involved in politics when they did not have the right to vote and how that reflects the prevalence of politics on all levels of society. How does this compare to the current election? There are several points made just even in this first chapter that present a range of ideas and points that can easily create a discussion among students. Neely will be presenting at the House Divided workshop on Friday, June 13 on the Politics of the 1850’s. Look on A House Divided YouTube Channel for an interview of Neely from this workshop. *Mark E. Neely Jr., The Boundaries of American Political Culture in the Civil War Era (Chapel Hill:The University of North Carolina Press, 2005), 2. The Smithsonian Institute presents an online review of its Civil War collections at its CivilWar@Smithsonian website. The site contains a number of smaller pages offering brief over views and accompanying images. The topics covered range from Slavery & Abolition to Life & Culture of the period. Images include portraits of important characters in each topic, photographs of artifacts, and postage stamps from the Confederacy. Drawings and paintings by Winslow Homer are also included, many of these depicting the Civil War from the battlefront. A sampling of Matthew Brady’s photography is also included. This includes images of the major players of the Civil War and other popular characters of the day. Certainly a useful site for further illustrating the Civil War era. A virtual field trip to the Smithsonian Institute’s Civil War collections. Antebellum and Civil War era songs! I was looking around on American Memory and found two pictures of “contraband” camps that were in Harpers Ferry. As I have not seen pictures of these types of camps before, I thought I would point them out. See them here and here. The National Park Service continues to present a trove of information on the Civil War. I found last night a project the service is undertaking to develop a network of places significant to the Underground Railroad. The program seeks to integrate and preserve Underground Railroad sites and museums throughout the United States. Supported by the Underground Railroad Network to Freedom Act of 1998, participants in the program will be able to receive technical assistance, display a uniform logo, and take part in program workshops. The website for the program, in addition to spelling out its goals, provides a helpful introduction to studying the Underground Railroad, including a glossary of terms, maps, and pages with information ranging from codes and ciphers used on the railroad to stories of escape. A good resource for introduction to the topic and encouraging student interest. I ran into a great site today with tons of transcribed documents from the civil war. There are several categories to choice from including Soldiers Letters, Battle Reports, and Diaries. Its a great place to gain an insight on everyday life throughout the civil war.